The Gunners suffered their heaviest defeat of the season on Saturday when they lost 5 - 1 at Anfield , but goals from Granit Xhaka, Alexandre Lacazette , Aaron Ramsey and Pierre -Emerick Aubameyang helped them to only their second win in six games. After Ryan Sessegnon had missed two good chances for Fulham , Xhaka put the hosts ahead , finishing past Sergio Rico after a good cross from the impressive Alex Iwobi . Lacazette doubled the lead when he finished off Sead Kolasinac ’ s pull- back following a fine Arsenal passing move. Aboubakar Kamara pulled one back from close range for Fulham , but Ramsey converted the Gunners ’ third after Aubameyang had hit the post. Aubameyang ’ s deflected shot gave Arsenal their fourth and a deserved three points . It had been a poor festive season for Arsenal as they only managed a 1 - 1 draw at Brighton on 26 December before their thrashing at Anfield . The Gunners were again without Mesut Ozil , with the German still sidelined with the knee injury that kept him out of the Liverpool match , while Ramsey , out of contract in the summer and a transfer target for Bayern Munich, Inter Milan , Juventus , Paris St - Germain and Real Madrid , was only among the substitutes . 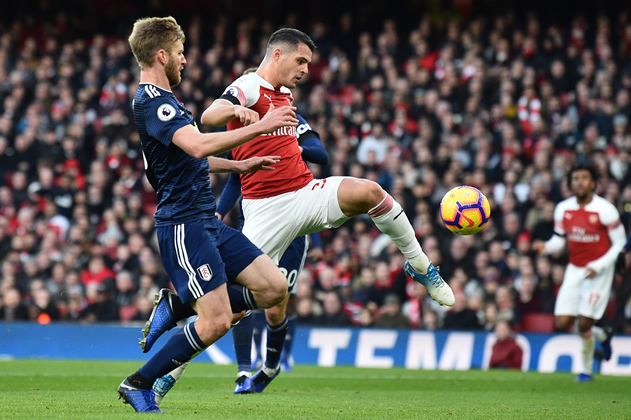 Nevertheless, the hosts took a 25 th -minute lead when Xhaka finished from Iwobi ’ s cross and they ended the first half strongly with chances for Matteo Guendouzi , Xhaka and Aubameyang .